Product prices and availability are accurate as of 2019-04-22 10:56:18 UTC and are subject to change. Any price and availability information displayed on http://www.amazon.com/ at the time of purchase will apply to the purchase of this product. 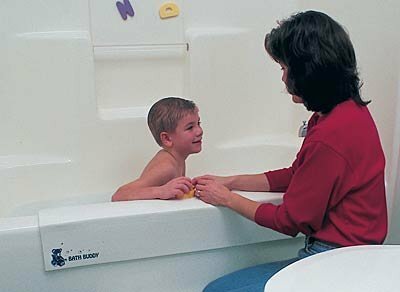 The Large Tub Guard helps make bath time more comfortable for parents. Place this soft cushion on the side of tub to cushion elbows during baby's bath time. 33 1/4" long x 5 1/4" wide x 5 1/4" tall. Non-toxic padded vinyl material. Use with Tub Guard Kneeling Pad which is sold separately. 31 1/4" long x 4" wide x 4" tall Non-toxic padded vinyl material.